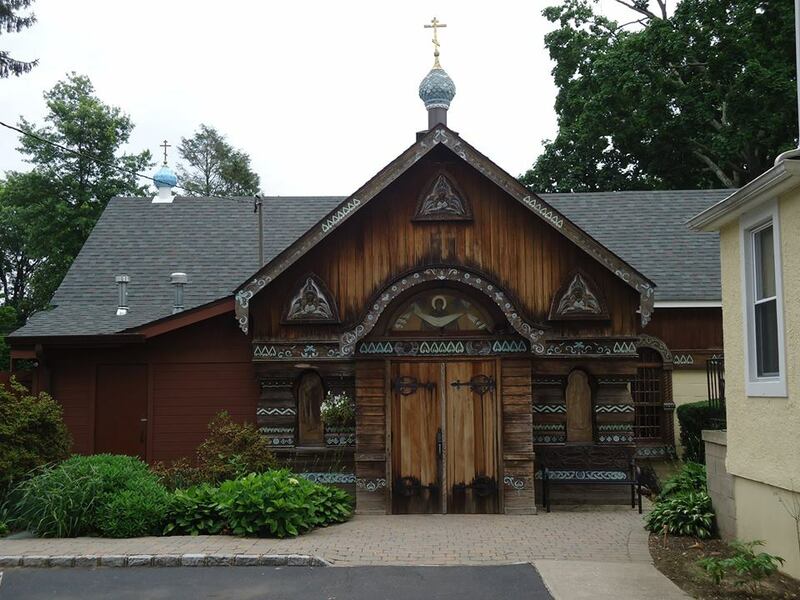 On Saturday, June 27, 2015, I attended a fascinating Orthodox Women’s Conference held at the historic ROCOR Church of the Intercession of the Holy Virgin & St Sergius in Glen Cove, New York. Here are some pictures I took of the beautiful, small chapel. 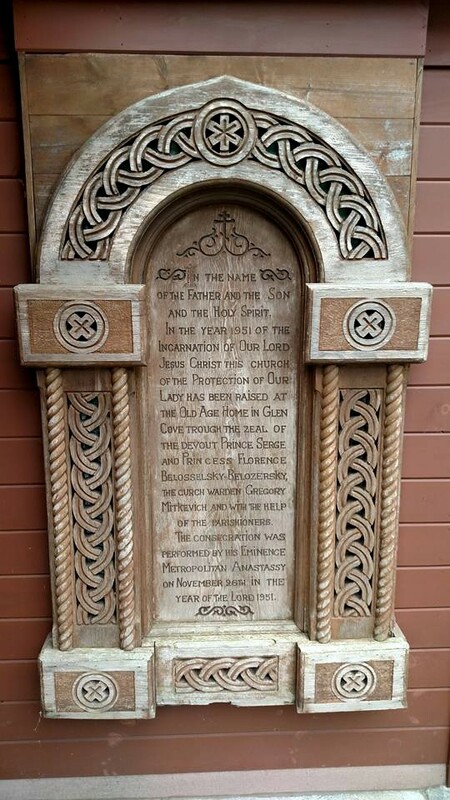 Dedication plaque commemorating the founding of the parish in 1951. 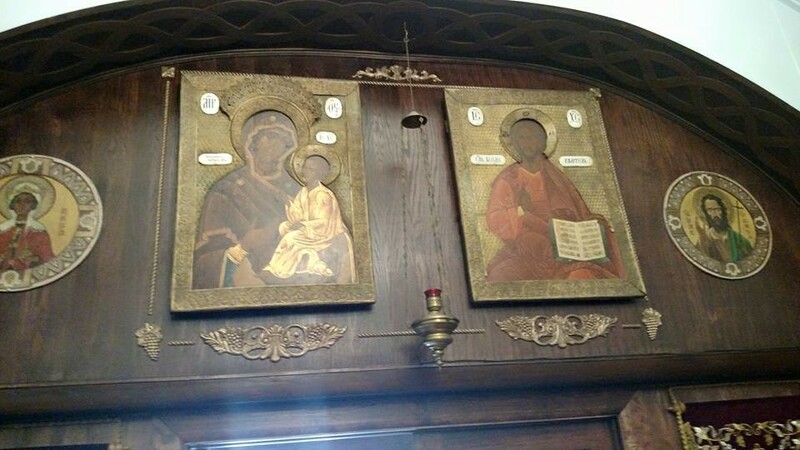 These icons of the Lord and the Theotokos are originally from Tsarskoye Selo, the “Tsar’s Village”, the residence of the Russian Imperial Family. The conference theme was “Living and Thinking Orthodoxy Yesterday and Today”. Dr. Nadieszda Kizenko, Associate Professor of History at SUNY Albany, moderated the discussions. It was a great joy to see my spiritual father Metropolitan Jonah, who spoke on the theme of “Sharing Orthodoxy with Teenagers”, as well as my godmother, who both came up from Washington, DC along with a dear friend Sister Eisodia. Several wonderful parishioners from St John the Baptist ROCOR Cathedral in DC were also present for the event, which was attended by probably 70 people, mostly laity. The very kind Fr. Demetrius Nicoloudakis and his daughter Anastasia visited from Pennsylvania, and it was a great joy to meet them. Metropolitan Jonah spoke first, and then sat through the second presentation before returning to DC with my godmother so that they could attend Vigil at St John’s for his name’s day the following day. Dr Valerie Karras, Adjunct Lecturer in New Testament at Eden Theological Seminary and board member at the St Phoebe Center for the History of the Deaconess, spoke on “The Liturgical Roles of Women in the Early and Byzantine Church”. This presentation was especially fascinating, as she covered a topic of great interest to me, the institution of the female diaconate which existed from the apostolic age up to the twelfth century in Constantinople. Following this second lecture, a delicious lunch was served by the volunteers. After lunch, Sr. Dr. Vassa Larin, whose sister Natasha Fekula organized the conference, spoke on the question of “Does Tradition Change?”. Sister Vassa, Research Fellow at the Institute of Historical Studies at the University of Vienna, is the popular host of the YouTube channel “Coffee with Sister Vassa”. Following this fascinating lecture, Professor Kizenko moderated a series of question-and-answer with the audience. At the end of the conference, I asked Dr. Karras if she had time for a brief interview. She warmly responded ‘yes’, so below, please read for yourself the results of our interview. 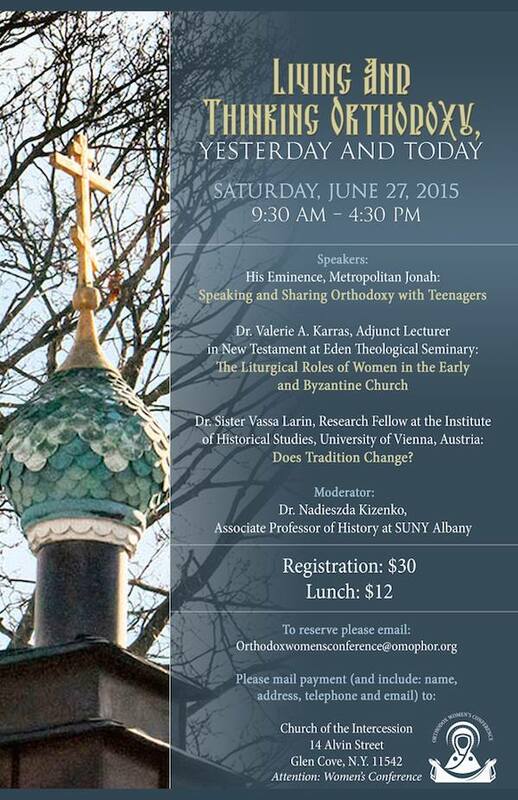 June 27 Conference Poster for “Living and Thinking Orthodoxy: Yesterday and Today”. Ryan Hunter: I’m with Dr Valerie Karras who just presented at the Orthodox Women’s Conference here in Glen Cove, New York on June 27, 2015. Dr Karras, where did you pursue your Master’s and your PhD? Valerie Karras: I received my Master’s in Theological Studies from Holy Cross Greek Orthodox School of Theology which is the official seminary of the Greek Orthodox Archdiocese. It’s located in Brookline, which is a suburb of Boston, Massachusetts. I then went to The Catholic University of America in Washington, DC and did all of my doctoral work there. I then went to Greece to start working on my dissertation, but I also enrolled in the doctoral program at the Aristotle University of Thessaloniki. I actually ended up finishing that doctorate, doing that dissertation, and completing that first. I then came back to the States and began teaching and finally finished my dissertation for Catholic University. Ryan Hunter: What led you to become interested in the subject of the female diaconate in the early Church? Valerie Karras: I had done some research on it and read about it during my Master’s, and some more during my doctoral work at Catholic University but actually it was really after I did my doctorate at Thessaloniki [that I became interested], because the topic of my doctoral dissertation at Thessaloniki was on patristic views of gender, the ontology of gender, looking at their exegeses, their interpretations of the creation accounts in Genesis. Initially I was planning on that to be the first chapter of a much larger work on Orthodox women, on women in the Orthodox Church, but there was so much there that that became my dissertation. So after I finished that and came back to the United States, I decided to just ditch all the research I had done before then for my initial topic, for my Catholic University dissertation, which was on monastic influence in the post-iconoclastic period, and instead I decided to look at what women were actually doing liturgically in the Byzantine Church. Ryan Hunter: Who do you regard as some of your mentors, and how did they contribute to this field of study? Valerie Karras: There are so many along the way. My parish priest actually, Father George Nikozises, who had been director of religious education before he came to our parish, suggested I go to the [Holy Cross Greek Orthodox] seminary. I had been planning on law school. Then I decided that I actually wanted to work with the Church, but what I was initially thinking of was doing administrative work dealing with our church choirs, I was very involved in the music of the Church. He said to me, “I think you need a stronger theological background”, so he suggested I go up there [to Brookline] to get my Master’s. I enrolled in the MTS [Master’s in Theological Studies] rather than the MA in Church Service because I was already doing the fieldwork so to speak, I was very involved with the National Forum of Greek Orthodox Church Musicians and the Diocesan Choir Federation, so I thought “I’ll just take as many theological classes as I can”, and then I fell in love with it, I just wanted to do Church history and theology. At the seminary I had several professors who were supportive, in particular Father Ted Stylianopoulos and Archbishop Demetrios (Trakatellis), who at the time was Bishop Demetrios. Father Ted is the one in fact who suggested that I apply to Catholic University, I had not even heard of it. It was a perfect program for me, for what I wanted to do, and also where it was located in DC, because Dumbarton Oaks Byzantine Library and Research Center is right there. Bishop Demetrios (at that time)– because I was debating about whether to switch to the MDiv program, which was a three year program– said to me, “You’re going on for a doctorate, you don’t need to do that.” One of his classmates was Elaine Pagels, now a professor at Princeton, and he said “She came right out of her undergraduate work. Just go on and do the doctoral program.” So I did. The other women who were at the seminary when I was there were important. Koula Fitzgerald, who had already graduated when I started as a student there, kind of mentored us together, and shared some of this material with us. Then over in Greece my dissertation chairman was very supportive even when I was doing stuff that he didn’t necessarily agree with, coming to conclusions, but he actually found one for me. At one point I had found all of this material from almost every Church Father I was looking at on how they don’t think that there will still be male and female, that the distinction literally will not exist in humanity in the eschaton, and we will no longer exist as male and female, as men and women. I found that in everybody except for Chrysostom, and he [my dissertation chairman] said to me “Oh no, Chrysostom has it too,go and look at his homilies on Matthew” where he deals with the Sadducees asking Jesus about what I like to call ‘one bride for seven brothers’, a take off of the musical. Sure enough, Chrysostom doesn’t say it in so many words, but there’s no other way to understand it, he says “notice that Christ does not say that they shall be like the angels insofar as they do not marry, but rather that they shall not marry because they shall be like the angels”. Well, the angels are sexless, genderless beings. Zizioulas was really the most important one [at Thessaloniki], Metropolitan John of Pergamon, particularly when I first got there [Thessaloniki] because he was the only one of the three on my committee who spoke English. I spoke French with Fondoulis, who was the Liturgics professor there, for about two years until my Greek got good enough that I could carry on a conversation. Ryan Hunter: Metropolitan John Zizioulas, the same one who the Ecumenical Patriarch just sent to comment on Pope Francis’ latest encyclical, Laudato Si, on the environment? Valerie Karras: Yes, and he’s the one who’s also in charge of putting together the agenda for this Great and Holy Synod, the Council that’s going to be held. He’s probably the Constantinopolitan Patriarchate’s most important ecumenical officer. Metropolitan Kallistos (Ware) last night [at Fordham University] said that he [Zizioulas] is the most important and best Orthodox theologian in the world today. I was really excited that Zizioulas was willing to work with me, and it’s funny because when I first met with him about this topic, I said that what I was expecting to find was that the Fathers were products of their time, that there would be some sexism, but I thought that on the theological level, this was my own feeling on the theological level, that sexual differentiation is an intrinsic part of human nature and that is somehow a reflection of the divinity, that it’s part of being created in the image of God, and Zizioulas kind of gave me this small smile, he said “I don’t think that’s what you’re going to find, but you start doing the research.” I did, and once I started doing the research, it took awhile for the Fathers to convince me, but they did and my views changed 180 degrees, so then I was like “Oh no, nobody wants to hear what I have to say because it’s going to be the ‘kill the messenger’ syndrome'”, and I have gotten a fair amount of that, people who don’t want to accept that this is really what the Fathers are saying. I’m very big on intellectual honesty, and I just put it out there, that this is what they [the Fathers] have said. You don’t have to accept it, these are all theologoumena, they’re not essential for salvation, just as you don’t have to accept the idea of women being ordained today to the diaconate, so that’s an issue that the Church needs to determine today. But you have to recognize that this is what these people said and did. Those are historical facts, you don’t get to choose your facts. What you want to do with them and how you want to understand them today in our contemporary situation is a different issue. Ryan Hunter: Your presentation earlier highlighted the variety of consecrated and liturgical roles filled by women in the early Church. These roles gradually fell into abeyance. Do you realistically see them being restored? Valerie Karras: Some of them have been, and it’s weird how they’ve been restored in different ways. I’ve noticed that a number of parishes at least in the Greek Orthodox Archdiocese, I’m not sure about the other jurisdictions here, they now have these young girls serving as myrrh-bearers during Holy Week. Now I would actually like to see what the Church of Jerusalem did, because it’s interesting — those [myrrh-bearers] were women [grown women who anciently filled the role of myrrh-bearer] and I think that there is still this issue…we have to deal with this crazy issue that somehow menstruation makes you impure. I think that’s why we like to see these younger girls dressed all in white, it’s all this purity idea. My response to that is going all the way back to that Didascalia Apostolorum from around AD 250 and it says “What’s the matter with you, woman, do you think that you’re without the Holy Spirit during this period? If that’s the case, you really have lost the Holy Spirit”, and then it goes on to say none of these things, and it mentions things like nocturnal emissions– these are all basic bodily functions, God has made our bodies this way, none of this is impure. I think that just takes care of it. Ryan Hunter: Even after the Genocide? Valerie Karras: Right, yes there were many, in fact I gave a talk at the large Armenian church in Worcester, Massachusetts when I was a professor at Hellenic College/Holy Cross, and the priest there, who had grown up in Jerusalem, he remembered a female deacon at the church or the cathedral there — I’m not sure where exactly it was, and I don’t know, now I can’t remember whether this was something that he saw regularly, or whether she just happened to be visiting — because all of their female deacons in the nineteenth and twentieth century were nuns. He remembered her serving liturgically and that she did everything that the male deacon did, served identically, and in fact in that photograph that I showed [earlier at the conference] she [the Armenian deaconess] is vested identically to the male deacon. Valerie Karras: Yes. A friend of mine, a colleague from another institution who’s of Armenian background, her family found a photograph of a great aunt who was a nun who was apparently also an ordained deacon. It’s a photograph of her with several of the other nuns who were deacons in this monastery, they’re all wearing the orarion. They’re not vested completely, but they’re wearing the orarion. It’s just amazing. Now the Coptic Church, as far as we can tell, there’s maybe some evidence that there were female deacons in the early Church, in the Church of Egypt, but not a lot. Ryan Hunter: After the Chalcedonian schism, or? Valerie Karras: No, it would have been before. They [the Coptic Church] have deaconesses today, they have a lot of them. They’re not ordained as a major clerical order, they’re consecrated. Ryan Hunter: They’re considered a minor clerical order? Valerie Karras: I’m not even sure it’s considered clergy, I think it’s more of a tonsuring and consecration. They’re doing all the kind of typical work that you would see of deaconesses in terms of social service and religious education and that sort of thing. Ryan Hunter: What’s astonishing about what you just pointed out, the fact that it’s the Coptic Church that has resurrected and restored this practice–arguably this is one of the Churches that has suffered more in recent years than many of the others, so in times of crisis, in times of such turmoil, they’ve restored this ancient practice. Do you think there’s anything to be said for the argument that the first world Orthodoxy, so to speak — the United States, Canada, Britain, parts of Europe–they haven’t restored this practice because they haven’t encountered the kind of persecution that makes them want to restore that aspect of what the early Church did? Ryan Hunter: Your presentation earlier suggested that many of the ancient vocations open to women in the Church — consecrated widows and ordained deaconesses for instance — could and should be revived. How do you see this being accomplished? Valerie Karras: One way would be to do what Saint Nektarios [of Aegina] did. 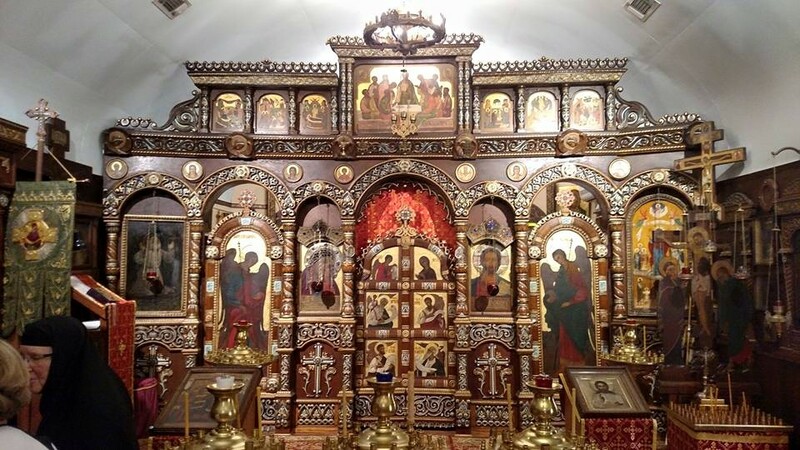 I think people forget that it has only been about a century — it’s really been less than a century — since we had a few female deacons in the Church of Greece ordained to the diaconate according to those euchologia (εὐχολόγιa) [prayer books with the services in them from the priest’s point of view]. So we’ve got Saint Nektarios doing this, and I think that’s a really important precedent that nobody said [this was impossible] even though there was some disagreement about what we had done. Nobody said it’s not legitimate, how could you say that when we have this long history? Presumably, all he did was use the rite, the service [of ordination] that’s right there in the older εὐχολόγιa. Ryan Hunter: Were there any efforts by other hierarchs at the time to discipline him in certain ways for ordaining the women as deacons? Valerie Karras: I think he was getting some sort of flak, because I think that’s why he wrote the letter to the Archbishop of Athens saying “well they were really ordained more like subdeacons” [a clever defense of his having ordained them at all]. But again, what’s the function? We have different functions for subdeacons and deacons. Subdeacons do not do petitions [during the Liturgy, e.g. “In peace let us pray to the Lord”] and these women did. I think that’s amazing because they [female deacons] didn’t do petitions even during the Byzantine period. The whole reason that he [St Nektarios] had ordained these women was because this was a women’s monastery [at Aegina] on this little island and they didn’t always have a priest, and he wanted them to have a fuller prayer life, a fuller liturgical life and cycle of services, their Liturgy of the Hours which is so central to monastic life. So it made a lot of sense, and I think that’s exactly why when the Synod of the Church of Greece decided that they would look at restoring the female diaconate, they wanted to restore it starting with these women’s monasteries, [they believed] that there was a real liturgical need there. Now I think that our parishes equally need them, not so much for liturgical reasons, although that can certainly help there too, but for pastoral reasons. Ryan Hunter: You kind of touched on this before regarding certain Russian royalty that were active in this regard, but has any of your research touched on the role of Emperor St. Nicholas II or his sister-in-law Grand Duchess Elizabeth in supporting the institution of female diaconate in pre-revolutionary Russia? Valerie Karras: No, I’m sorry to say that I only know a couple of things that I’ve read [in this area] because my own time periods of specialization are the Early Church and the Byzantine Church, so I don’t really deal with modern Church at all. Ryan Hunter: I asked you this earlier, but I didn’t get it recorded, so I wonder if you could perhaps touch on this again. You mentioned that most Byzantine women were not public figures, but then we have the imperial consorts, the Augustae, the Empresses, and then we have some instances such as Irene of Athens of women who actually declared themselves as βασιλεύς, they declared themselves as emperors in their own right. Is there any evidence that you’ve come across that deaconesses, who would have been serving in the Byzantine Church at the time, were present at the coronation rites of Byzantine emperors or the empresses? Valerie Karras: I haven’t seen that. but then I also just haven’t seen the rites described in a detailed way that would say “this is all the clergy that do it”. Because of your question, I do want to kind of look back at Constantine Porphyrogenitus’ De Cerimoniis to see if he’s got anything. Now, I had mentioned about the Empress Helena — I’m sorry I can’t remember whether she was married to, I think it was Emanuel II [Manuel II Palaiologos], I’m not absolutely certain, but it was one of the Palaiologoses, but this is the Late Byzantine period. She took the Eucharist, she took communion, at the door to the altar. Now by that period we know that there were no longer ordained female deacons. There seem to have still been female deacons, women who were styled female deacons but had not actually been ordained, but this may have been used as a monastic title. We know about that coronation, that enthronement, very well because of this Russian pilgrim who writes about it in detail. But it’s unfortunately in this period after female deacons. Valerie Karras: Presumably they were following Byzantine custom. Ryan Hunter: All of the Russian coronation rites were based off of the available Byzantine service rites and customs. Valerie Karras: So even though we only know this about Eleni, about Empress Helena, it probably was occurring with many or even all of the other empresses as well. Pulcheria’s situation is unusual because she was essentially reigning, particularly after her brother Theodosius II died [in AD 450]. She does take Marcion as her consort, but she’s the one who’s still running the show, because when she convokes the Fourth Ecumenical Council at Chalcedon [in 451] — I remember this because of the work I was doing on monasticism — she sent out an imperial letter demanding that all the monks stay in their monasteries and not be wandering around and showing up at the Council [and disrupt the Council proceedings] because that had been an issue two years earlier with what was called the Robbers’ Council of Ephesus in 449. Ryan Hunter: So the Empress Pulcheria herself, in her own name, wrote this letter, issuing an imperial edict? Ryan Hunter: One other question. I personally am not afraid of this happening, I don’t see it as a threat of any kind, but as Sister Dr. Vassa Larin said earlier, the Church does not exist in a vacuum. Keeping that in mind, do you have any fear that people both within and without the Orthodox Church would mistake the restoration of the historic female diaconate as opening the door for advocates of women to the presbyterate [priesthood] and even to the episcopacy? How would you address those concerns? Valerie Karras: Well obviously people do have that fear, and that’s why you get some really bad theology and a failure to be honest about the historical record from somebody like Father Lawrence Farley, who then admits that his concern is that if we were to restore the female diaconate then a female priesthood will be not far behind. No, I don’t accept that, because there are two major differences here. One is that where we have a long and solid history of the female diaconate, we do not have that with women ordained to either the priesthood or the episcopacy. So it’s a completely different issue on that level because it’s not a question of restoring something that historically existed, it would be a question of changing the eligibility for those two offices in our faith. So I think that’s one major difference. The other issue is that these are two very different offices [the priesthood and the diaconate]. It really concerns me particularly when clergy don’t seem to understand the difference between the diaconate and the priesthood. Now there’s a relationship between the priesthood and the episcopacy, in fact of course one of the titles for bishop is ἀρχιερεύς, chief priest, head priest. So [in the Liturgy] the priest is acting on behalf of the bishop, that’s what the bishop signs the antimension that the priest has on the altar, so the priest is able to celebrate the Divine Liturgy, the Eucharistic Liturgy, and the other sacraments on behalf of the bishop. The only sacrament that the bishop does that the priest cannot do is the ordination of higher clergy, or of clergy generally. In the case of the deacon, the deacon is kind of a liminal position. Even though the deacon is ranked as one of the three major orders of clergy — we see that from the early Church orders, there’s clearly a distinction in the ordination rite, and certainly that’s made explicit in some of Justinian’s legislation — even though the deacon is ranked with the priest and the bishop as part of the hierosyni or priesthood in the broader sense, one of the major orders of clergy, the diaconate is still kind of a liminal office. As I mentioned before, the priest doing all these sacraments, being able to celebrate the sacraments, the deacon cannot; the deacon cannot be the celebrant, the deacon cannot baptize, the deacon cannot celebrate the Eucharist; he assists in the celebration of the Eucharist but he is not himself the celebrant. Deacons cannot marry; in the Roman Catholic Church where the theology is that it’s really the two people getting married who marry each other, the deacon can be the one overseeing this because he’s really just the witness, but in our Church we see the priest or bishop as actually the celebrant of the marriage, and therefore it cannot be a deacon doing it. So the deacon is very different from the priest and the bishop because the deacon does not celebrate the sacraments. The word ‘deacon’ comes from διάκονος (diakonos), diakonia, the Greek word that means ‘service’. We see from the New Testament on that their primary roles were to do what we would today call social service, and they also did administrative functions — archdeacons, that sort of thing, they did a lot of the administrative functions for the Church. The second thing that shows this difference, I think, is, strangely, the funeral rite. A deacon is buried as a layman, it’s the same rite as we use for the laypeople. They do not have the rite that is done for priests. Ryan Hunter: Is that uniform throughout Orthodoxy? Valerie Karras: It should be. Ryan Hunter: Interesting. So everything that you’re saying is underlining the fact that there is this clearly articulated distinction between the order of the presbyterate, the priesthood, and the diaconate? Ryan Hunter: So you’re not concerned that there would be some sort of push — “well, women have the diaconate now, so let’s jump to the priesthood”? Valerie Karras: No, I don’t think it works that way. Don’t take this to mean that I don’t think that women can or should be ordained to the priesthood or the episcopacy; I’m saying that it’s a completely different subject, it is not closely related to the diaconate for the reasons I just said. Ryan Hunter: Thank you very much for your time, and it was a very interesting interview. Thank you as well for your earlier presentation.